This translucent solar bubble pedometer is a great way to go solar and digital for clients who want to get fit! The eco-friendly compact counter calculates calories burned, steps taken and distance in miles for the walkers, runners and athletes among your clientele. 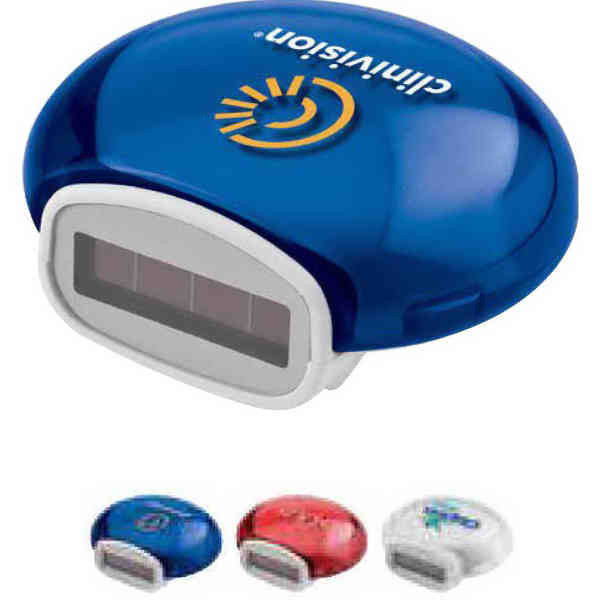 Measuring 2" W x 1 1/8" H x 1 3/4", it features an attractive jewel tone, solar or battery power and convenient built-in belt clip. This product is RoHS compliant and ideal for gyms and fitness programs. Hand out a bit of the future today! Size: 1 3/4 " x 1 1/8 " x 2 "